Lighten the dull months with colour from this spectacular flowering cherry tree. A deciduous, spreading ornamental cherry tree with rosy pink, semi-double flowers from November right through to March. Creating a long-lasting, delightful display to brighten the grey winter months. 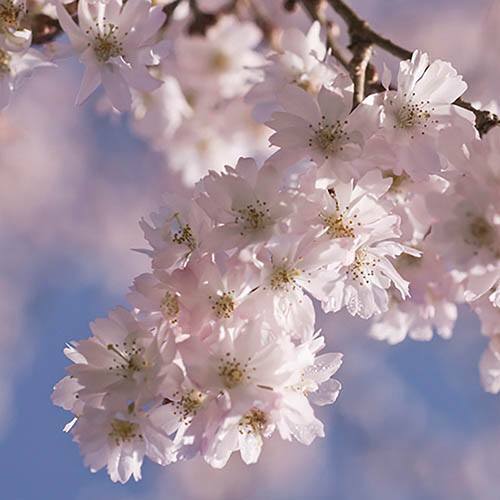 Also known as the Rosebud Cherry and the Winter Flowering Cherry, 'Autumnalis Rosea' is a colourful addition to any garden, as the leaves also put on a spectacular show later in the year. Great for wildlife too as the flowers attract pollinating insects while birds and small mammals are drawn to the dainty fruits that follow. Supplied as an established plant in a 7.5L pot and growing to just 4m x 2m metres in 20 years (approx. 12ft x 6ft). Prunus × subhirtella 'Autumnalis Rosea' is a deciduous, spreading ornamental cherry tree with rosy pink, semi double flowers from November right through to March depending on the temperature, creating a long-lasting, delightful display to brighten the grey winter months. Also known as the Rosebud Cherry and the Winter Flowering Cherry, 'Autumnalis Rosea' is a colourful addition to any garden, as the leaves also put on a spectacular show later in the year as they turn from green to fiery yellow, orange and red before falling. Supplied as an established plant in a 7.5L pot this is an ideal addition for smaller gardens, growing to just 4m x 2m metres in 20 years (approx. 12ft x 6ft). The winter cherry is also tolerant of pollution making it perfect for today's modern town gardens. Makes an eye-catching specimen for a lawn or spring border where it can be underplanted with bulbs, or why not create an avenue with a number of plants. Remove your prunus from its pot and tease out a few of the roots. If you’re planting in spring or summer, water 'Autumnalis Rosea' well and regularly for the first few months.